Purchasing an instrument can be challenging and time consuming. 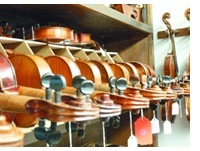 At Master Hand Violin Shop, we are skilled in helping you select the best instrument for you or your child. To serve you best, we carry a diverse selection to instruments rather than stocking our collection from a limited number of makers. We encourage you to take your time looking through our instruments, and we will not pressure you to purchase. Before coming to try instruments, there are a few things to consider. 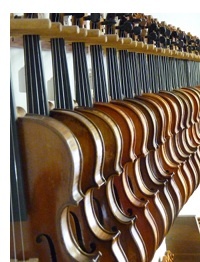 First of all, we recommend that you consult with your private teacher for any guidelines or preferences he/she may have about the instrument's sound or country of origin; many teachers do have firm preferences about students' instruments. We also recommend determining a spending limit. This limit should be based on how much you are willing to spend, how much rental credit (if any) you have with us, and how long you intend to play. Remember that you will need to factor in a bow and case to the overall cost. While we have excellent instruments available in all price ranges, a serious player will typically look to spend more than a casual player. If you cannot purchase your desired instrument at this time, you may purchase a less expensive instrument now and put the cost of the trade-in of that instrument towards a nicer instrument later. When you come to try instruments, you should allow for at least an hour to try instruments. This way, you will have adequate time to try different scales, pieces of music, and bow strokes on the instruments in which you are interested. We have several instruments available in every category and price range. We recommend that you bring along sheet music that you are comfortable playing, as you will want to play the same music or scale on every instrument you like. Once you have narrowed down your preferences to two instruments and two bows, you may take them out on trial for one week. This gives you time to practice with the instruments, hear them in different settings, and take them to your teacher for his opinion. You may repeat this process as many times as you desire. You may want to try bows at the same time that you try instruments, but you may also want to wait until you select your instrument to pair a bow. You will probably want to select your case last. We accept all major credit cards. We also offer 90 Days - Same As Cash for purchases over $1000.00 and 30 Days - Same As Cash for purchases under $1000.00. We have a lifetime guarantee for all our instruments. If you discover any defects with your instrument, we will repair it free of charge or allow you to select an equivalently priced instrument for no charge. If you wish to trade in your instrument to purchase a more expensive instrument, we will allow you to apply 90% or more of the price you paid towards the purchase of a new instrument. You must present your original receipt in order to participate in the upgrade.